Hirst explains that, ” mathematically, with the spot works, I probably discovered the most fundamentally important thing in any kind of art. Which is the harmony of where color can exist on its own,interacting with colors in a perfect format”. The spot prints are amongst Hirst’s most widely recognized works. Of the thirteen sub-series within the spots category, the ‘Pharmaceutical’ paintings are the first and most prolific. The random and infinite color series within the ‘Pharmaceutical’ paintings is integral to the works. Hirst explains that, “mathematically, with the spot paintings, I probably discovered the most fundamentally important thing in any kind of art. 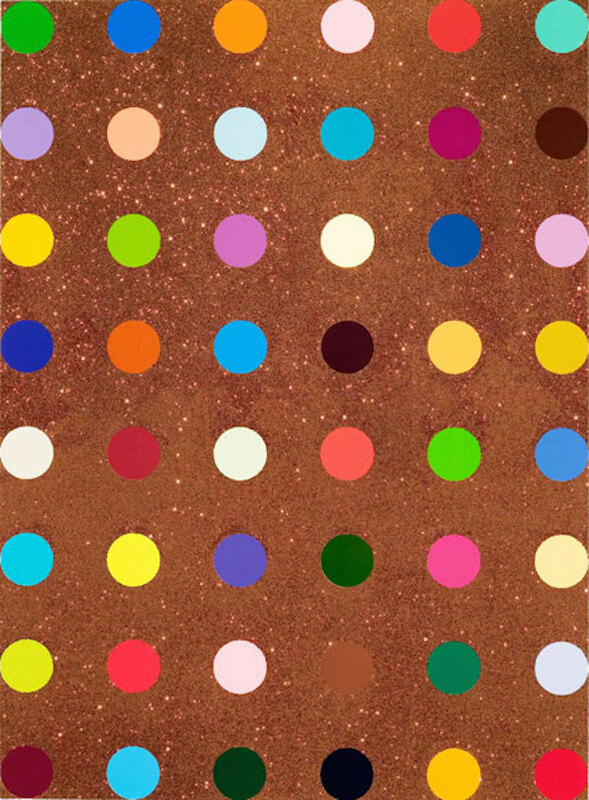 Which is the harmony of where color can exist on its own, interacting with other colors in a perfect format.” Any problems he had previously had with color, Hirst claims, were removed by the perfect arrangement of complimentary, yet never repeated, colors in the spots. Whilst in his second year, Hirst conceived and curated ‘Freeze’ – a group exhibition in three phases. The exhibition of Goldsmiths students is commonly acknowledged to have been the launching point not only for Hirst, but for a generation of British artists. For its final phase he painted two series of coloured spots on to the warehouse walls. Hirst describes the spot paintings as a means of “pinning down the joy of colour”, and explains they provided a solution to all problems he’d previously had with colour. It has become one of the artist’s most prolific and recognizable series, and in January 2012 the works were exhibited in a show of unprecedented scale across eleven Gagosian Gallery locations worldwide. In 1991 Hirst began work on ‘Natural History’, arguably his most famous series. Through preserving creatures in minimalist steel and glass tanks filled with formaldehyde solution, he intended to create a “zoo of dead animals”. In 1992, the shark piece, ‘The Physical Impossibility of Death in the Mind of Someone Living’ (1991) was unveiled at the Saatchi Gallery’s ‘Young British Artists I’ exhibition. The shark, described by the artist as a “thing to describe a feeling”, remains one of the most iconic symbols of modern British art and popular culture in the 90’s. The series typifies Hirst’s interest in display mechanisms. The glass boxes he employs both in ‘Natural History’ works and in vitrines, such as ‘The Acquired Inability to Escape’ (1991), act to define the artwork’s space, whilst simultaneously commenting on the “fragility of existence”. Stating: “I am absolutely not interested in tying things down”, Hirst has continued over the last decade to explore the “big issues” of “death, life, religion, beauty, science.” In 2007, he unveiled the spectacular, ‘For the Love of God’ (2007): a platinum cast of a skull set with 8,601 flawless pavé-set diamonds, at the White Cube exhibition ‘Beyond Belief’. The following year, he took the unprecedented step of bypassing gallery involvement in selling 244 new works at Sotheby’s auction house in London. Describing the sale as a means of democratizing the art market, the ‘Beautiful Inside My Head Forever’ auction followed Hirst’s Sotheby’s event in 2004, in which the entire contents of the artist’s restaurant venture, Pharmacy, were sold.